Thirty-eight special-education students from Somerset Elementary and High School worked with local craftsman Bruce Martell to design and create this stone and tile bench with local craftsman Bruce Martell to design and create this stone and tile bench. From the north: Hwy 35 south to Hwy 64. Turn west to first light at Cty Rd I / Sunrise Drive Turn south to Forrest Drive. Turn east. Bench is near fountain and southern most ball field. The Apple River rushes through Somerset, carving a a canyon bordered by 100-foot limestone bluffs. Just downstream, it flows into the St. Croix, which forms the western border of the town. 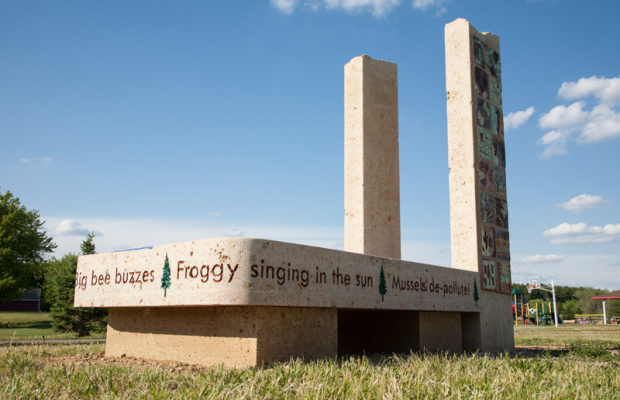 The rivers were a major inspiration for the city’s Art Bench, explains Bruce Martell, a local carpenter who guided the project – with help from a local stone company and a bunch of students who don’t often get such opportunities. Two limestone pillars stand seven feet above the bench’s surface. They represent the Apple, Martell says, and its towering bluffs. A winding ribbon of blue flows across the bench’s surface, representing the meandering St. Croix. Those rivers were the highways that the French settlers who founded Somerset used in the 1850s. Connecting to that heritage was important for Martell, a descendant of Somerset settlers who homesteaded at the confluence of the Apple and the St. Croix in 1855. Connecting with the community was an important aspect for the young people involved, recalls Dave Folkert of Somerset School District. 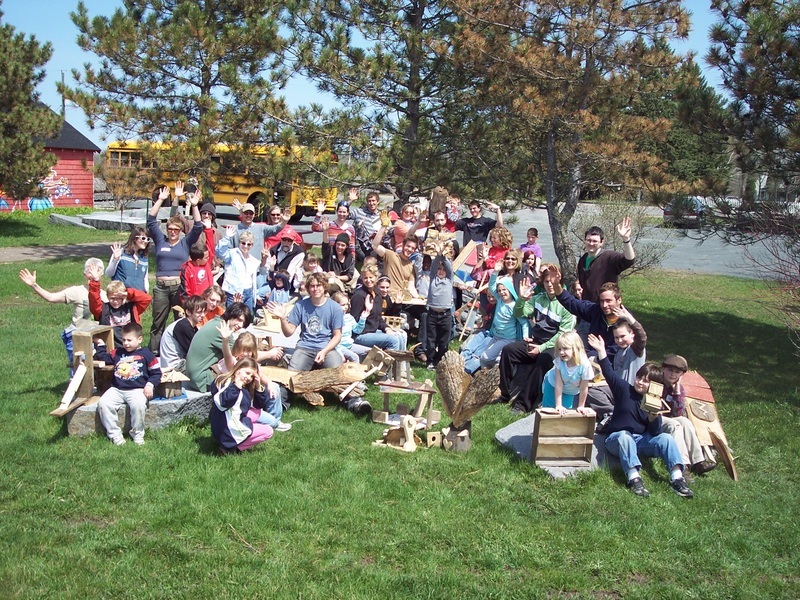 “The Bench Project’s core assumption is that everyone has a creative spirit. This was an opportunity for Somerset residents to better understand how abilities outweigh disabilities,” Folkert says. The students involved were all from the district’s alternative or special education programs. They don’t participate in many extracurricular activities because of economic reasons, working parents who are unavailable, or they don’t fit into existing programs. But working on the Art Bench gave them a chance to show what they can do, and an opportunity to expand their interpersonal skills. “This is a group of kids usually on the fringe, who don’t often get the opportunity to be leaders. When we jumped into this project, one of my goals was to put them in the role of being a leader. I saw a transformation, the confidence that they received by having that role,” says Folkert. 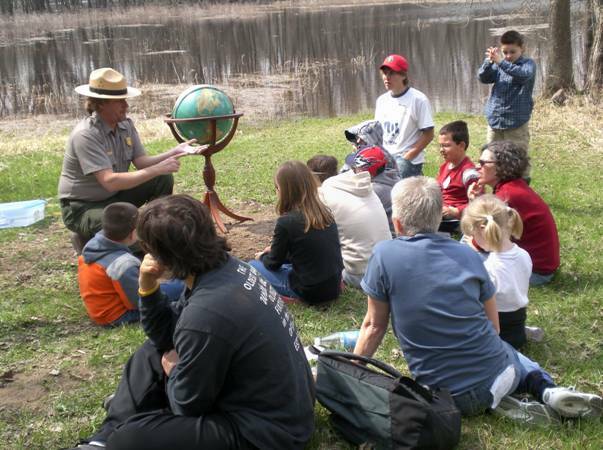 To express the participants’ sense of place, the students, their teacher and the artist dove into the history and nature of the St. Croix Valley. They visited Martell Landing – the site where Bruce’s ancestors first built a cabin in the early years of the region’s logging boom – now a nonprofit environmental learning center. 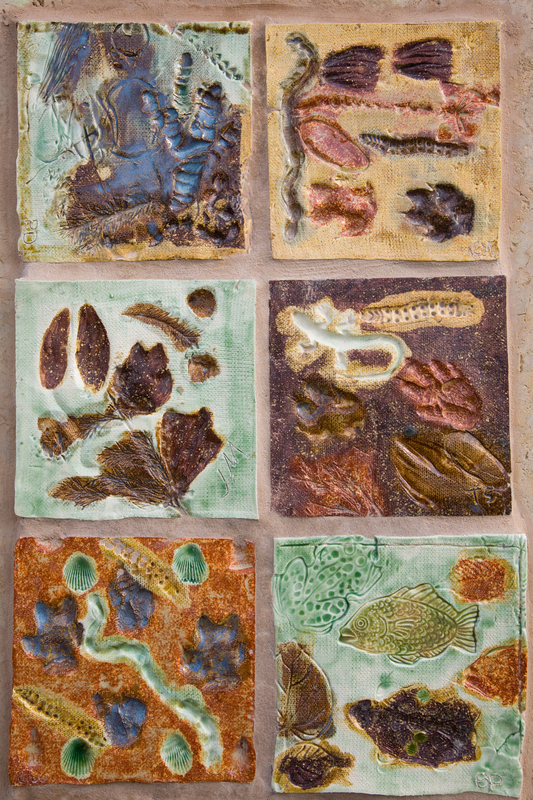 They collected natural objects from the banks of the Apple River and imprinted them on tiles which were affixed to the bench. 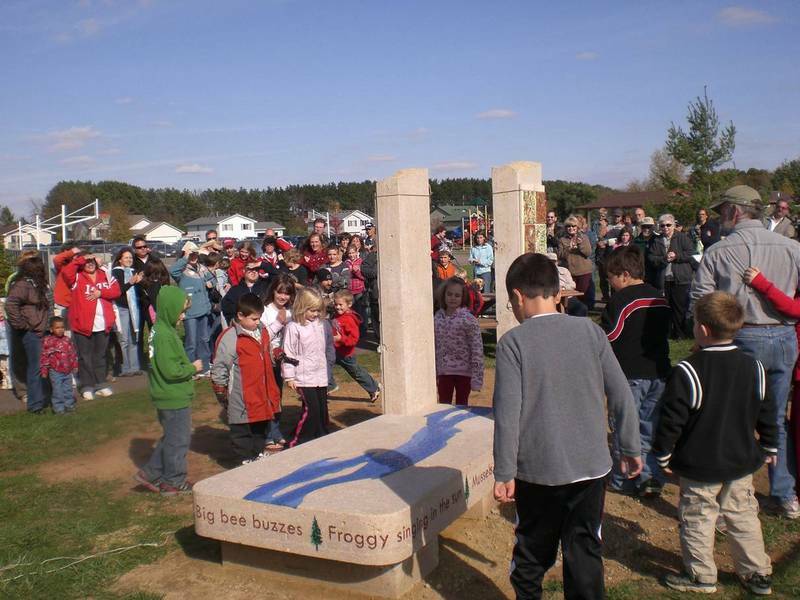 They toured the recently-finished Art Bench in St. Croix Falls. And they visited Rivard Stone’s quarry, where the material that would become their bench was excavated. Martell says it was clear from the beginning that the bench should be constructed with local limestone from Rivard Stone. Rivard ended up not only providing the stone, but exceeding the group’s expectations. “Rivard did things we didn’t even know was possible, like inscribing the poem the kids wrote around the edge of the bench,” says Martell. Using the local limestone not only connected the bench to Somerset’s geology, but means the bench should stand for many future generations. It also means that more than a ton of cement was needed for the footing, to make sure the bench doesn’t sink into the earth or tip over. Folkert designed a plywood box to form the footing, and the older students involved did a lot of the digging. Imagine being one of the rivers flowing through the landscape in this area. Bring a pencil and paper and write down a list of the creatures you would find living in or near the river. What do they do? What sounds do they make? Combine these lists to create a poem about life on the river. In partnership with Franconia Sculpture Park, Martell’s Landing, Rivard Stone, Somerset Legacy Society, St. Croix County Land and Water Conservation, St. Croix National Scenic Riverway, St. Croix Valley Community Foundation, The Phipps Center for the Arts, Village of Somerset. With a grant from National Endowment for the Arts and support from B & J Hardware, EconoFoods, Landry Landscaping, LeMire Landscaping, Osceola Lumber, Somerset Rental. Help from art teachers Becky Olson and Amy Stevens, and community members Dale Cox, Aleisha Miller and Anastasia Shartin.